Catfish and Cornbread: Uga VII ... rest in peace. God bless that sweet-hearted dog. Sad news....sad day....even worse than the UGA VII news was the news about Chance Veazey. Prayers out to Chance and his family. 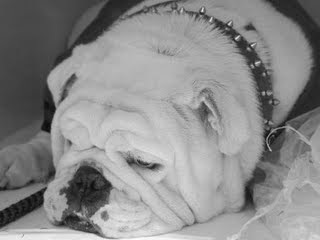 I'll say this about Uga VII, he was not the most animated Uga ever, but he was a great looking Uga. Almost flawless by Bulldog standards. 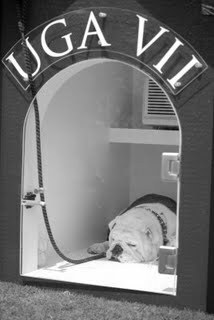 He didn't GATA like his dad, but he sure new how to take advantage of an air conditioned Dawghouse in front of 92,000 people who thought he was pretty special. Godspeed "Seven"! I blame his heart failure on willie's terrible defense. There have been times sitting in that stadium this year where I've felt like I was going to have a heart attack. Big, beautiful dog. Regal. I liked him because he didn't bark 48 times per minute. I can't believe he was only here for a season and a half.